Math activity to go along with the book Ten Apples up on top by Dr. Seuss. Students fill in their name and the number ten. Use finger dipped in ink, a bingo dauber, or simply have students draw 10 apples on top of their head! 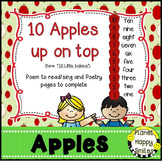 This activity goes with the book Ten Apples Up on Top by Dr. Seuss. There are animals. There are also apples with numbers 1-10 on them and plain apples. 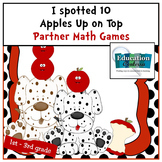 You can use the apples and animals for counting activities and preposition activities. 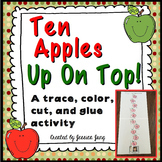 Here is a fun follow up activity that you can use with the book Ten Apples Up On Top. This download contains an individual student booklet to help them learn ways to make 10. Apples to print on card stock and tape to square wooden blocks. Students will practice stacking blocks in ascending or descending order. Works fine motor in addition to number recognition and counting. 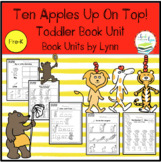 This is a short unit to be used with the storybook Ten Apples Up on Top by Dr. Seuss. Perfect for back to school time. Combine these lessons with other lessons or use on it's own. Included are lessons using art, music, reading, writing, math, and technology. 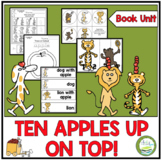 Expressive and receptive language activities and fine motor activities are provided for the story "Ten Apples Up On Top". 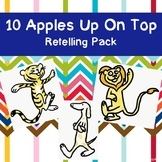 The students will enjoy listening to and completing activities to go with this rhyming story about animals and apples.